Starting in 1933 and ending in 1968, Canon made a long series of interchangeable lens rangefinders. They all fell under the general term of "Leica Copy" since they all but the earliest ones used the Leica Screw Mount. Still, Canon demonstrated much innovation and made many improvements to the general Leica design. Of the 33 generally available post war models, 19 of them look virtually alike at first glance! No other group of classic rangefinder collecting is as confusing. The odd thing is that Canon often made a very minor modification and considered it a new model. At first glance, most of the various post war II, III, and IV series rangefinders can easily be confused for each other. These 33 Canons generally fall into two groups: traditional Leica inspired designs and the later Canon innovative designs. 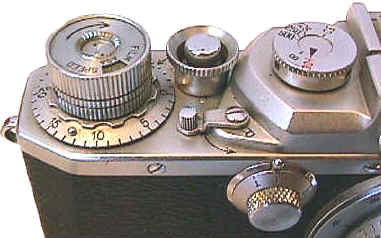 The first group ALL SHARE knob wind advance, bottom film loading, and separate low/high speed shutter dials. Yet they still showed Canon improvements, mainly in the viewfinder. 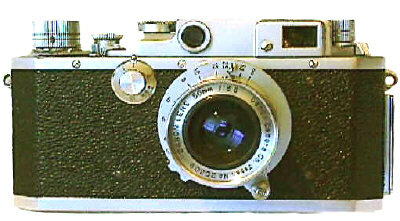 All but the earliest models shared a combined three position Viewfinder/rangefinder (as opposed to the Leica separate viewfinder and rangefinder). Thus the photog did not have to move their eyes from one finder to another to focus and compose. While Canon touted this as an improvement over the Leica system of a separate 50 mm viewfinder and high magnification rangefinder, in use I personally prefer the Leica design. I find the Canon design is just too "squinty" for my own tastes. This is a personal call, however, and I am sure some photogs have the opposite preference. 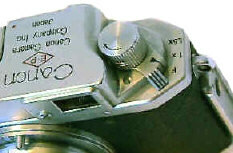 Canon also used a peculiar flash sync system of a sliding side rail flash connection -- rather than a standard PC terminal on its bottom loading bodies. In other words, you will not find a standard PC connection on the knob wind Canons -- unless it has been added. The IVSB2, IIS2, IID2, and IIF2 are the last knob wind Canons with a new improved shutter and larger easier to see finder. These are Canon's ultimate development of the traditional bottom loading Leica screw mount design. All were very similar, but different. The IVSB2 had a top speed of 1/1000 with flash bulb and flash sync. The IIS2 was a IVSB2 with lowered top speed to 1/500th. The IID2 was like the IIS2, but without sync of any kind. The IIF2 is like the IID2, but with flashbulb sync only. Confused? Don't feel bad, so is everyone else. 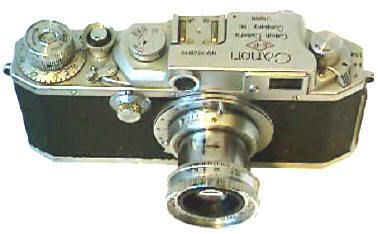 Note the traditional Leica layout of the camera, only different. Of this last group, by far the rarest is the IIF2 with a production of ONLY 2,625 cameras. Unlike Leica, later knob wind Canon rangefinders have a combined rangefinder/viewfinder. The three position finder offered three magnifications roughly equal to the 50/100/135 lenses. Parallax correction or brightlines were NOT part of the package. Does that rail below the camera strap lug look like a PC terminal to you? Well, it does the same thing when mated with Canon's flash units. The center of the high speed shutter dial on all of the last 4 Canon traditional bodies is made up of TWO parts. The earlier ones are all solid. You lift up the outer ring and match the marked speed to the inner arrow. Note the obvious Leica influence in design . They aren't called "Leica Copies" for nothing. What came after Canon's knob winds? The V, VI, and L series have automatic parallax correction via a pin in the accessory finder for auxiliary finders. This was really a great feature which was sadly used only in the various Canon V and VI models. This group culminated in the Canon 7/7s/7sZ, profiled separately.